Build your confidence to take on bigger projects. Training you can use today to improve your filmmaking abilities. Principles you can use with ANY camera or lighting system. Complex theory made accessible & applicable to your productions. Film education that grows with you and doesn’t cost $30,000 per year! I’m really enjoying your tutorials. I learn so much in such a short amount of time, whereas it feels like I have to watch an entire Lynda.com 6 hour tutorial and only glean one or two things I didn’t know. Watch and learn from our online video lessons on cameras & lighting. Ask questions & get feed back from mentors & other members. You have enough to keep track of, so we let you know when there are new articles that will help you improve your filmmaking. And don’t worry- we hate spam as much as you do. So we only send updates when you’ll benefit from them. Access articles that are packed full of insider tips, tricks, and advice that will give you a leg up and help you improve your filmmaking skills. Lessons to get you up and running with any camera. We cover topics such as types of camera bodies, lenses, aperture, shutter speeds, settings, recording media, cables, filters, workflow, and much more. Sometimes watching a whole video for the third time is too time consuming. Thankfully, you are able to quickly and easily get the answer you need by searching the transcript of every Camera Foundations lesson. You will have lifetime access to the Camera Foundations Module. Lighting a scene can be very daunting. It is much more than setting up a light. In this module we cover the role that light plays in a project, how to embrace shadows and why they are so important, how to light scenes different ways, lighting inside and outside, daytime and night time, and adding mood a feeling to your story through your lighting. We then take all of these lessons and put everything together as we show you how we light various projects, including narratives, commercials, and documentaries. Sometimes watching a whole video for the third time is too time consuming. 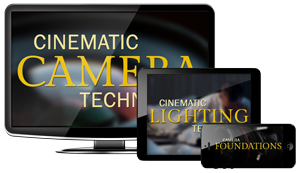 Thankfully, you are able to quickly and easily get the answer you need by searching the transcript of every Cinematic Lighting lesson. You will have lifetime access to the Cinematic Lighting Module.